Bed bug hunters is a professionally certified and insured company, member of the BPCA, NPTA, CEPA, BASIS PROMPT and CHAS safe contractors’ scheme. During the years of successful bed bug eradication and control in London we have specialised in all kinds of toxic and non-toxic treatments, providing bespoke domestic bed bug control and integrated bed bug management for businesses in various industries. In the recent years, with the increasing number of people travelling and due to the chemical resistance of bed bugs to most commercial insecticides, businesses in the hospitality and transport industries, in particular, have been paying the cost. Bed bug detection in whole blocks of flats, hotels, schools and universities, even in ships, airplanes and airports is practically unthinkable to be done by a single pest technician. It may take days or even weeks to investigate a big hotel and the costs will be considerably high and unjustified. As a result, we have developed a one-of-a-kind bed bug sniffing dog unit that will be able to achieve maximum bed bug detection success rate at lower costs, which is the best solution in such cases. As members of NASDU our bed bug sniffer dog unit and their SIA qualified dog handlers are able to detect any kind of live infestation with a short notice and same day booking possible. Working in compliance with the highest standards, such as the BS 8517:2-2010, our thoroughly trained dogs will detect odours of live infestations and even eggs, while nests of old infestations will not affect them in any way. 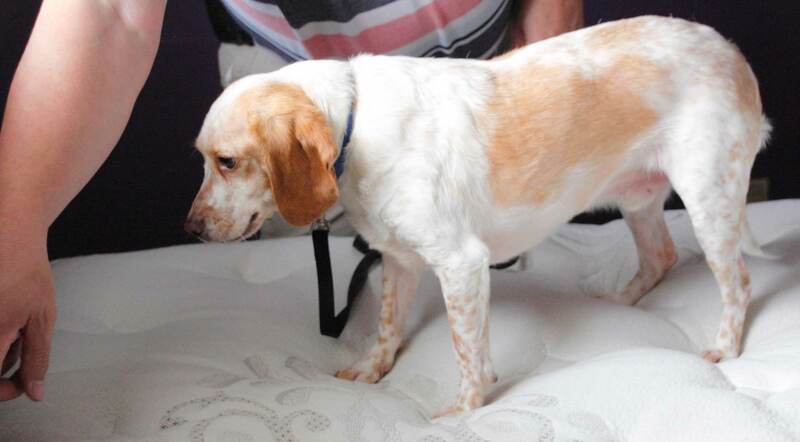 The Bed Bug Hunters canine team will inspect and detect the presence of any bed bug life stage in an average sized room in under 5 minutes, where a pest technician will require 20-30 minutes or even more. The bed bug detection success rates are also unmatched when comparing the bed bug sniffing dogs to all other detection methods. Bed bug traps are the least efficient method of them all with less than 20% detection success rate in early stages of infestation. A human inspection by an experienced pest technician of the same infestation will achieve not more than 30% efficiency, as the hideouts of these insects could be impossible to see if located under floorboards, skirting boards, in walls, furniture, and other inaccessible places. Dogs have proven to be far more accurate in bed bug detection than people, saving time and money for your business and being able to carry out the work with less disruption and inconvenience. Proactive inspection of a commercial property by bed bug dogs will ensure that an early stage of an infestation will be detected on time, before it becomes a more complex and serious problem. For businesses dealing with customers on a regular basis it is essential that the risk of compromising your good name and reputation is kept at a minimum. Unlike many other pest control companies, we are very discrete, as there are no logos on our uniforms and vehicles. Our K9 unit will be able to quickly and effectively determine which areas require treatment, so that they can be targeted directly with less disruption and cost implications. After the inspection our pest technicians will risk-assess the property and recommend the best possible treatment method. We offer a variety of toxic, non-toxic and combined treatments for maximum efficiency, using the most advanced professional products and equipment, compliant with the related pest legislation, business standards or personal requirements.